We carry no stock items. All furniture is custom made to order. 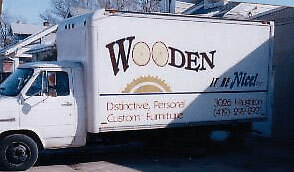 If you would like an estimate on a piece of furniture, please provide information through our contact form. All initial price estimates are only preliminary and cannot be construed as an actual quotation or proposal. Further communication with each client is necessary to determine the exact specifications, functional uses, and design criteria for each piece of furniture. All final agreements are made in writing, with a 50% deposit due prior to project beginning. For long distance orders, stain preference can be chosen at your local Sherwin Williams store and the information sent to me. Free delivery ONLY within 100 mile radius of Toledo, Ohio - Standard Delivery Area. If you are located outside of the standard delivery area, a zip code is necessary to determine shipping charges. All shipping charges, insurance, and any applied surcharges are at the expense of the customer. I prefer to build the shipping crate myself and will only charge materials cost for doing so. Built-ins and mantels are available only in the Toledo area. Information submitted via the contact form on this website will remain confidential.